“Yes! We Have No Bananas” is the title of a novelty song by Frank Silver and Irving Cohn from the 1922 Broadway revue Make It Snappy. Sung byEddie Cantor in the revue, the song became a major hit in 1923 (placing No. 1 for five weeks) when it was recorded by Billy Jones, Arthur Hall, Irving Kaufman, and others. It was covered later by Benny Goodman and his Orchestra, Spike Jones & His City Slickers, and many more. It also inspired a follow-up song, “I’ve Got the Yes! We Have No Bananas Blues”, recorded by Billy Jones and others in 1923. 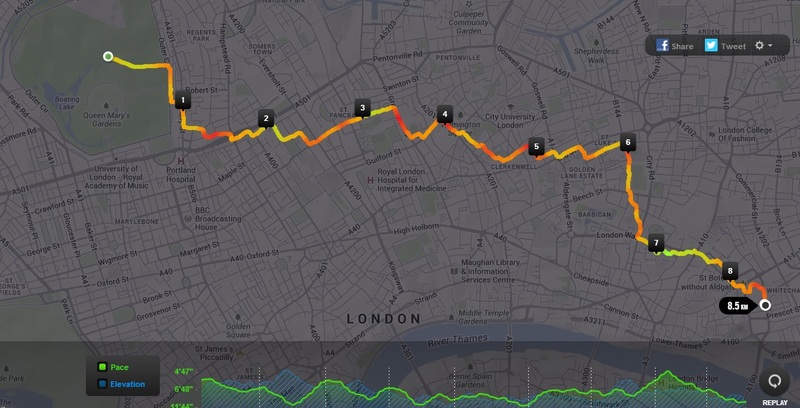 And why I being Jude the Obscure at the start of this post about the LONDON SUMMER 10K? Let me tell you. This was the third 10K in 3 week as part of my training. 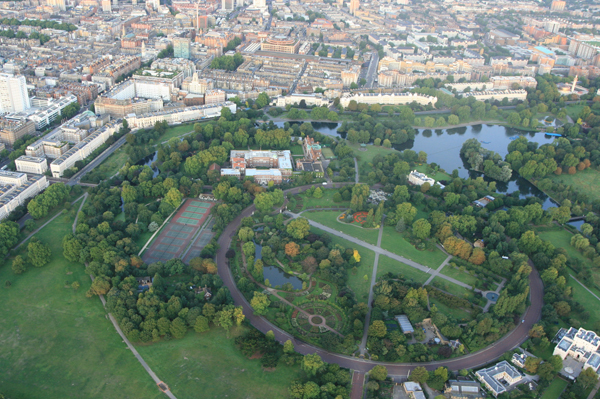 I ran Greenwich Park a fortnight ago, York last week and this week I got the underground to the noble Regent’s Park. 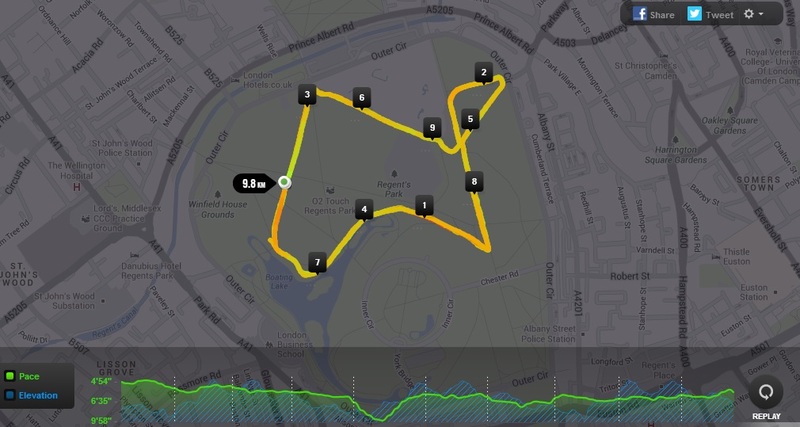 (I have also run Hyde Park, Green Park, St James Park so really I must be collecting them). Grateful of any opportunity I signed up for this about a month or so ago and, as you will remember from a recent post, double-booked myself on the same day with the Richmond Park 10K with the same company. Regents was closer and would allow me, if fit enough, or well enough, to run home and double my distance. I walked in with a lost runner who was looking for the Monkey Gate described in the race letter as the start, but had discovered that it was not on the map. (Good start – 5 points) But fortunately I read the same letter and was looking for the Hub as the destination for our timing chips, and that was on the map, so we headed there. This also included a much needed toilet. I have been drinking 4-5 pints of water a day on the paleo diet and it runs through me. The water is running clear so to speak. So, we found the race tents, no sign of a Monkey Gate but, seeing as we were close to the Zoo (and venue for the Stampede 10K next month) I am guessing there was one. Although Bob (I never asked his name, so think I will give him one for the sake of this adventure) never found it. Same race chips as London last year I think. I saw paper bag goodie bags ferried to the start and finish line and children, of all things, with numbers on too. Children? Children! I had horror flashbacks to New Orleans and blobs of people walking from the off, walkers pushing strollers among the race pack slowing us down. But, heaven be praised, there was actually a children’s race to start, and then a 2K fun run for adults who shouldn’t be attempting more. The race took us three times around the northern part of the park. 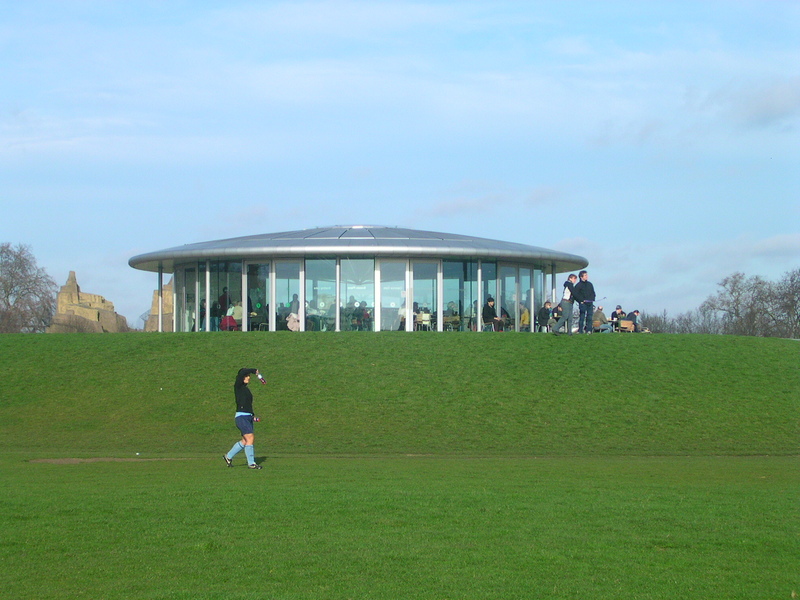 There was a couple of hills, but nothing compared to Greenwich. It was hotter than expected and I had my under armor on. Grey clouds were overhead but bore no fruit. I started at the back. I was in no mood to get caught up with anyone wanting to race off at the beginning. This was all about control for me. Could I leisurely sub hour with little or no stress on me? And I did. I even had time, after all that water, to stop at the toilets half way to let out all that water I had drunk beforehand. Although with the toilet break I am sure my time is just over the hour, I paused it before and started it after and I was sub hour, so I was happy. And dare I say happy and well? Yes. I was so happy and well after the race that I turned the 10K into almost a half marathon with a slow run walk home that, oddly, was about an hour. 1:02 actually, so roughly hour splits. When I signed up for this run I was excited. My second bling rack was filling nicely with summery awards. There were oranges and yellows and reds. A nice change from last years predominant blues and greens and blacks. I had signed up for both Richmond Park and Regents Park and, when asked, the organiser said the bling was comparable between the two. It was one of the non-bespoke medals you get from any website or trophy maker, but I don’t have it so that is all good. 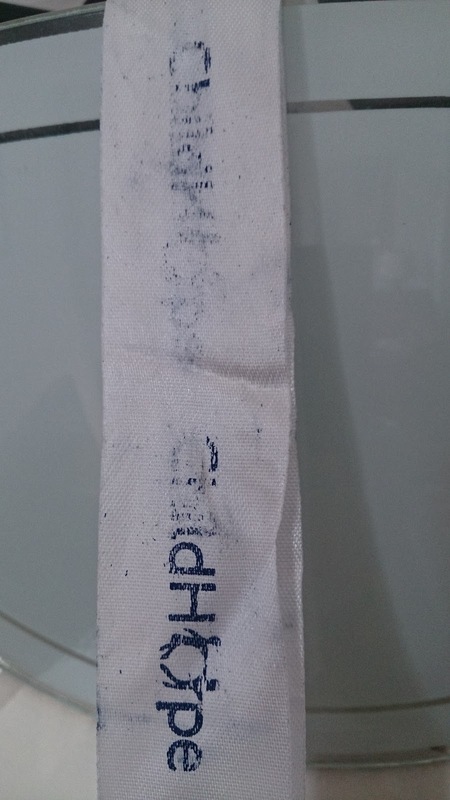 The ribbon, however, was not good. I was walking along and noticed blue ink on my fingers and clothes, like I had fallen foul of a Bic biro. It was from the ribbon. It was cheap, or recently done, and the ink of the charity name had rubbed off and gone everywhere. This was quite shocking. Not only did I not get my banana, energy drink or mini pretzels, of the 700 odd runners only a quarter of them got a gift bag. Now, I am not saying there was a banana, or energy drink or mini pretzels in said bags, but there could have been. I had paid £22 for this race and got? 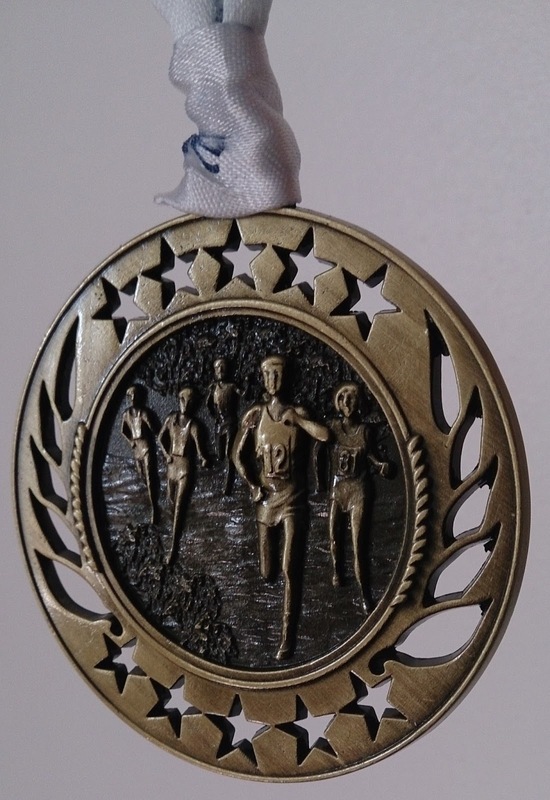 A medal that cost about £1.50 with the race engraved on the back, taking it to about £2.50. The water stops were water in cups, not bottles, although still welcome. And the volunteers did a good job. I think I just expect more now I have experienced good and bad. So average bling with cheap printed ribbons that rub off, no goodie bag, but… as I said, my main aims were to finish sub hour (check), finish well (check), finish well enough to run home – doubling my distance (check) and beat Bob (check) so all in all it was a good day. Would I run it again? No.